Autodiscover for Exchange is a simple utility application that allows you test the Microsoft Exchange Autodiscover process with your iOS device. The application starts with an email address and begins looking for the appropriate Autodiscover server. If found, Autodiscover for Exchange will authenticate the request and return the full list of user settings available for the email address specified. When results are found they are presented in a simple table view. Tap on any of the entries and an alert will appear showing the full value for the corresponding setting. Tap on the "Report" button and you will see all of the steps taken by the application to reach the Autodiscover server as well as the complete list of key-value pairs representing all user settings found. The report can be then be emailed to an email address of your choice. Autodiscover for Exchange uses the Microsoft SOAP (web services) interface that was implemented beginning with Exchange 2010. This initial version will not work for Exchange 2007 or earlier as they did not implement the SOAP interface. 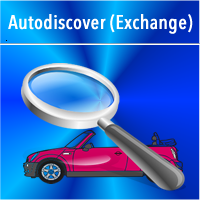 Autodiscover for Exchange is FREE during its introductory period. It will serve as a great diagnostic tool for your Exchange environment… add it to your toolbox now! May 20, 2013 -- Version 1.0 of Autodiscover for Exchange RELEASED! Autodiscover for Exchange is now LIVE on the AppStore! Use the link to the left to visit the app page in iTunes! A new application named "Autodiscover-Exchange" was submitted for review to the AppStore today! It is a FREE utility application that allows you to query the Microsoft Exchange Autodiscover service associated with an Exchange hosted email address (for Exchange 2010 or later). Autodiscover for Exchange was written initially as a standalone test of our ability to interface with Microsoft's Autodiscover service. We wanted to incorporate Autodiscover capability into MiniECal since its inception, but deferred its implementation for a few iterations of the product. We also wanted to implement Autodiscover support modularly which required building an independent set of classes that could be "dropped in" to any product that needed that support. As you might imagine, that also meant we could put a simple UI around these classes to test them and the resulting application is a fairly neat/compact utility program. Autodiscover-Exchange is that product and it is (for now) free to download. Give it a try with YOUR Exchange email address and see just how the Autodiscover server is found for YOUR email!